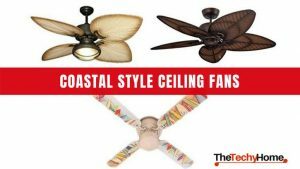 Hampton Bay ceiling fans are famous for offering an incredible variety of top-quality products. 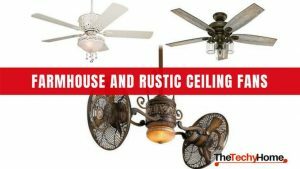 Wherever the kind of ceiling fan you’re looking for, this brand will probably have an option for you. Even though some models may be a bit more expensive than similar devices of other brands, you can always rely on their very durable materials, excellent customer support and safe wiring/construction. 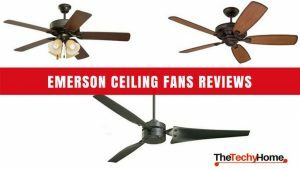 If you don’t know much about fans and are looking for a brand that you can blindly trust in quality, design, and service, then you have to check on the Hampton Bay ceiling fans. On this review, you can find the top-rated Hampton Bay fans on Amazon. Who Makes Hampton Bay Ceiling Fans? 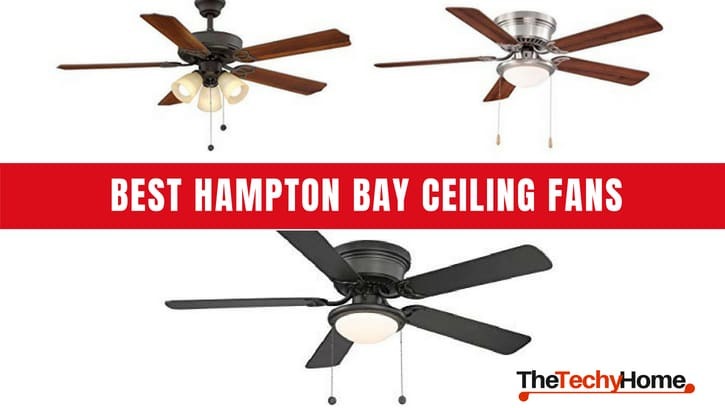 This Hampton Bay ceiling fan is the most basic and functional of the brand. With a sleek and modern, yet simple design, it’s perfect for commercial, school, hospital or office purposes. With for blades and a 14” blade pitch, it’s constructed to move a great amount of airflow with any of the 3 speeds, perfect for 20ftx20ft rooms. It also counts with a reversible motor for keeping the perfect ambiance in both summer and winter months. It also counts with a single light kit including a 100-watt halogen bulb and an etched opal glass lamp for diffusing the lights. As all Hampton Bay fans, it includes a remote controller for operating both the light and the air speeds separately. Very simple yet sleek design. Includes remote controller and light bulb. Includes one 4.5” downrod and compatible with an angled installation. Compatible with other light kits. The remote controller is cheaply made and may be crossed out if you have other fans/controllers. Fins are thin and delicate. This elegant Hampton Bay ceiling fan is ideal for those ones looking for an aged-style fan to add some decoration to their rooms. With a beautiful frosted glass lamp and 5 reversible blades with a gorgeous walnut/oak finish, this Venetian-styled fan will suit many different décors. It includes a remote controller as it is common in this brand for operating the 3 air speeds and a full-range dimming light feature. The best part is that it has a fair airflow offers practically no noise at all, except for the high speed that may rumble a little but still very quiet. Its easy installation and dual on/off controlling (cord or remote controller) make it a very user-friendly option with an excellent functionality/décor relation. Full range dimmable lights with one button push. Included remote controller for operating speeds and lights. Beautiful design for matching with several types of decoration. Reversible motor (manual) and reversible blades. Includes 2 60-watt light bulbs. The airflow is ideal only for medium rooms. The quiet function fails a little on the “high” speed. This indoor/outdoor Hampton Bay ceiling fan is ideal decorating any open or big room as well as decks, patios, and outside spaces. With a very beautiful nautical design lamp and white color, its award-winning design exalts and matches with many decorations, especially those ones that include sea reminiscences. Fan 3 speeds and light are controlled with pull-chain cord only. With a very powerful airflow, it 5 weather-resistant blades guarantee cooling down your inside or outside space for a very long time. It’s also energy efficient extending the useful life of the motor. The lights are very bright and not dimmable, which make it perfect for exteriors but may be uncomfortable for bedrooms. 2 13-watt light bulbs included. UL certified and wet rated. Resistant construction and painting for both inside and outside. Downrod and angle mounted hardware included. The beautiful nautical design has won design awards. Unlike most Hampton Bay ceiling fans this model doesn’t include a remote controller. This Hampton Bay ceiling fan is the perfect fan to adapt to any decoration. 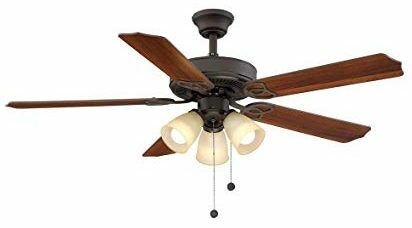 With a dark rubbed bronze base and 5 walnut/maple blades you won’t need to worry about changing your fan or blades when remodeling your home; it adapts to most common décor styles while offering an elegant simplicity. While it doesn’t include a remote controller, the pull chain cords easily control the lights, the 3 air speeds, and the reverse feature. With its multi-capacitor motor technology, you’ll get one of the quietest performances while still obtaining a great amount of airflow, among the most powerful ones in this decorative line. While the lights must be on all three at a time, the yellowish light kit offers a diffused/softer illumination that makes a great ambiance without dazzling. While not adaptable for mounting on angled ceilings, its traditional mounting system is really stable, helping to avoid any rumble or vibration. 3 13-watt CFL light bulbs included (60-watt equivalent). Powerful motor with 3-speeds strong enough to cool down a medium/large room, living or dinner. Adaptable design with reversible blades avoids having to buy new parts if changing your décor. 54” wire included for accommodating downrod. One of the quietest ceiling fans on its line. Lights can’t be controlled separately; they must be all three on or off. It doesn’t include a remote controller. Not so easy to install. On very different design style, we have the Hugger, one of the soberest and modern Hampton Bay ceiling fans. With a very dark finish and minimalist appearance, it will match modern decorations and black poster furniture perfectly, as well as any minimalist design. The reversible blades also offer two options to combine with décor; one side is pitch black while the other is mahogany. The light kit resembles those old frosted schoolhouse lights giving it a bit of dark look, ideal for those who love the Gothic style. When talking about performance, this fan also has a lot to offer. 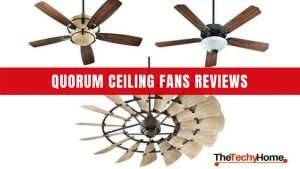 Considerably stronger than traditional decoration fans such as the previous model, the hugger can easily cool down large indoor rooms but may be a bit louder than the other reviewed fans. It only can be mounted as a hugger and operated by pull chain cords, so if the ceiling is too high it might not be very convenient. Very powerful 3 speeds of airflow ideal for large indoor rooms. Beautiful sober and modern design with reversible blades in two significantly different shades. Easy to install and comes with really understandable instructions. Hugger design, ideal for low ceilings. Soft light ideal for bedrooms thanks to its frosted lamp. Not ideal for high ceilings. While not intrusive, this fan is not so quiet. The pull chain cords are not too strong. Users report imitation products sent, beware that the fan you receive is actually Hampton Bay. 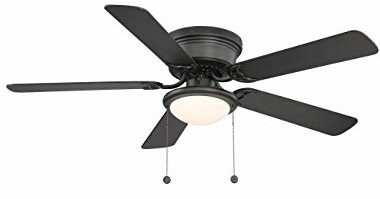 The white version of the previous Hampton Bay ceiling fan when it comes to design, but this model offers a very important feature that places it over its dark brother. That feature is that the motor on this model is multi-capacitor, what solves the noise problem while still offering the same potency in airflow. The result is a fan that can cool down a large indoor bedroom or master room while still allowing an easy sleep. Nevertheless, it does offer a very soft white noise for drowning out conversations in other rooms. Another good feature on this fan that the previous model didn’t offer is a reversible motor, which allows creating the perfect breeze in both warm and cold months. When it comes to the design, it’s completely white, while offering reversible blades. One side is white too and the other side is bleached oak for adapting to your decoration. The light is displayed by an opal frosted white flat bowl that doesn’t draw so much attention to the eye when entering the room. The hugger installation is perfect for low ceiling rooms but wouldn’t be so convenient if the ceiling is high as the fan can only be operated with pull chain cords. A considerably quieter performance while still offering some white noise. 3-speed reversible motor with great airflow for big inner rooms. Flush mount installation ideal for low ceilings. Reversible blades allow the fan to adapt to your decoration. Convenient lamp for low ceilings. Not ideal for high ceilings as the pull chain cords could not be reachable. 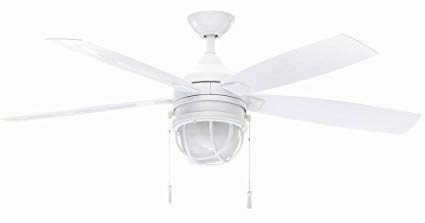 With more than 200 positive reviews, this very classical yet adaptable hugger is without a doubt the best Hampton Bay ceiling fan you can find on Amazon. It’s the third brother on the hugger reversible-blades model but this one without a doubt is the most adaptable of them all. Its beautiful brushed nickel finish with maple/walnut reversible blades gives an antique and elegant touch to any room. At the same time, this color combination is compatible with almost any decoration available or at least the most common so you won’t have to worry about changing the fan or buying new blades if you change your décor. Its integrated opal frosted lamp is also quite adaptable while giving a sober general look. This model also includes the multi-capacitor motor which is at the same time powerful enough to cool down a large inner room (20×20 ft sq) but with a really quite performance. The reversible controls allow you to change the direction of the blades for adapting to the warm and cold months. The mounting is mostly ideal for low ceilings due to the hugger design, besides as it operates with pull chain cords, installing it on a high ceiling may make them unreachable. A very adaptable design will combine with any decoration. Quiet performance that still provides a white noise perfect for sleeping purposes. 3 strong air speeds for a big inner room. A flush mounting perfect for low ceilings. High ceiling installation is not convenient. Light may not be bright enough. 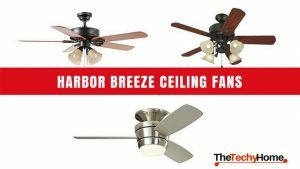 Hampton Bay ceiling fans are the house fan brand of the known house chain Home Depot. This means that when acquiring any of these products you have the relief of being supported by a reliable store. Home Depot products are not only top-quality, but they’re also endorsed by the reliable chain customer support. This means that if anything goes wrong with your ceiling fan, you can always receive spare parts, technical support and even refund without problems. But that’s not it! Home Depot’s Hampton Bay is probably one of the most versatile brands, with hundreds of different products available for your comfort. While they’re not all available in Amazon, the ones that are presented in this review can give you a general idea of what you can find regarding performance, quality and design. 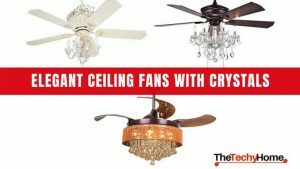 On the other hand, most ceiling fans of this brand include or are compatible with remote controllers, which mean your comfort is also assured. Also, every Hampton Bay product comes with an identification number which allows you to authenticate the original quality of your fan. This is quite important as many imitation products are sold as Hampton Bay, especially online. Finally, this brand and store chain offers warranty for all their products so you can rest assured that you’ll be supported when you do the smartest purchase.